» A TV Series Review by Michael Shonk: JERICHO (1966-67). Never seemed to have aired in Europe. And…. 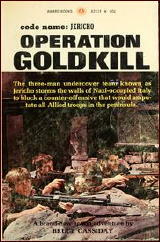 is that an FN FAL one of the boys is wielding in a photo and on the cover of the paperback ?? And the haircuts would have been QUICKLY changed by ANY of the forces involved, US, British, French or German . 1. Doc, realism was not a goal for this series. 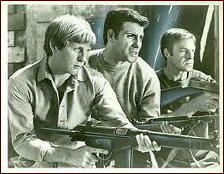 John Leyton’s haircut was probably an attempt to appeal to the fans of David Mccallum’s Illya Kuryakin (MAN FROM U.N.C.L.E.). Weapons played a role but more often it was them making ancient weapons to defeat the Nazis. Two examples of the believability issue I had with the show had them taking out a company of armed Nazis with a catapult or being unarmed and chased by Nazis shooting at them, they would knock out Nazis but not take their guns. If they used real weapons of the period I would be surprised. So it was THAT kind a series .Hmmm. No wonder it was dumped . Don’t forget that the abysmal HOGAN’S HEROES was on for six years. #4. The critics quoted in “Broadcasting” were lukewarm to the series, one comparing it to HOGAN’S HEROES. While the premise of HOGAN was not the most tasteful, it was one of the funniest comedies from that era with many of the writers and producers later writing for another war time comedy, M*A*S*H*. JERICHO was pure kids adventure with lots of action, no bothering for serious drama or plot, and few token women who might spoil the fun with mushy stuff. It wanted to be like the fun early seasons of MAN FROM UNCLE and instead was more like the silly stupid GIRL FROM UNCLE. Let’s hear it for HOGAN’S HEROES! One of my favorite English teachers in college was a real fan! Jonathan Winters is my all-time favorite comedian, but I can’t give him credit for this particular line. I’m pretty sure it was Stan Freberg who came up with it. Winters or Freberg- this line is SUPER !!!! Michael, you’ve once again illustrated that even the most dismal shows are interesting to write about, and read about. The fact that so many talented people responsible for so much of the programming that defined Hollywood episodic drama in the sixties and early seventies were involved in this show is in and of itself worth understanding. You’ve really done an admirable job of exploring these connections. The similarity to the MI music — so evident in the YouTube clip embedded — is particularly interesting to me. Hollywood was obsessed with WW2 during this early/mid-sixties period, with Combat!, Gallant Men, Dirty Dozen, The Great Escape, and on and on. Any mention of Hogan’s Heroes reminds me of my time at TV Land in the mid-nineties, when it was our top-rated show, and every day we would look at the overnights to decide whether we should leverage that by moving it to another slot or keep it where it is. The next time you think programming a “classic TV” channel would be a dream job, remember that! I wonder what Link and Levinson’s original script looked like. My guess is Dean Hargrove was brought in to make it more in MAN FROM UNCLE style, meaning more humor and more over the top plot. I suspect the original script had them smuggling out the conductor and singer but not everyone else. We all know of examples of musicians taking their music style from series to series, but this is the best example of that I have ever heard. I liked the fact both shows came out at the same time so there was no theft, just acceptable business. Most of the war series at the time were old fashioned male adventure and JERICHO was aimed at that market. It would be a market that was about to change because of the politics of the time (Vietnam War ruined all the “fun”). But JERICHO, as did MAN FROM UNCLE (the 1966 season) and GIRL FROM UNCLE, failed to take the stories seriously and got too silly and sloppy in production. The HOGAN’S HEROES stories I remember was how unhappy some of the cast were. Especially John Banner who was Jewish. I also remember how hard Gene Reynolds had to work to prove to Alan Alda that MASH was not going to be HOGAN’S HEROES in Korea before Alda took the part. #10. David, the problem with any “dream job” there are usually bosses to answer to that ruins the fun. I still dream of a cable network that will treat television with the same respect that TCM gives movies. All the Hogan’s Heroes I ever heard were about the close friendship between John Banner, Werner Klemperer, and Robert Clary – all Jewish, all refugees from Hitler (Clary spent much of the war as an inmate at Buchenwald), and all fiercely defensive of the show. It was Banner who said in a TV Guide interview that “Schultz is not a Nazi” – and he caught some PR hell for saying that. That’s how they got away with it in the ’60s; Hogan’s was more of a spy spoof than anything else, and that’s how CBS sold it to America. I suppose I ought to say something about Jericho, but the fact is, I never saw it. I do remember that CBS (or somebody) was trying to sell Don Francks as the Next Big Thing; right after this show ended, he starred in the movie of Finian’s Rainbow, which died the death at the boxoffice, although it has had a reputational comeback in the years since (mainly because it was Fred Astaire’s last musical movie). For his part, Don Francks went back to his native Canada, where he’s been holding forth in regional film and TV ever since. 12. Marino Mase also left Hollywood, returning to Europe for various minor roles including a role in one episode of the Italian TV series NERO WOLFE. I do recommend everyone try the two week free membership to Warner Archive Instant. The prints are beautiful (in fact I wonder if the lack of “day for night” shooting I mentioned in the review might have been done in the restoration process). You can check out the lineup without committing. The reference to Robert Clary reminded me of Harlan Ellison, who hated *Hogan’s Heroes* with a passion. He thought CBS’s next logical move would be a program called *Bergman of Buchenwald*. – it is in color. Most of the less expensive color film processes available were noticeably unstable – they tended to fade rapidly. The cyan (blue-green) values were the first to go; what was left behind looked mainly reddish, such as the clip above. Before it became common practice to transfer films to videotape for syndication, the film companies just made 16mm prints and “bicycled” them to the various stations, on a travel schedule that would discourage a human. This is why so many color clips from the ’60s and ’70s have that reddish look to them. I can recall seing color shows in syndie that looked more faded than b/w shows from a decade earlier. Today, the sheer expense of restoring the original color for video or digital transfer is what prevents many series from being rescued from archive hell. Some ’60s/’70s color shows that I have on C2C DVDs look like they were delivered by way of a combat zone.No doubt they’d look better restored, but who’s gonna foot the bill? In your list of Jericho‘s guest actors, I see that you forgot to mention Martin Kosleck, one of Hollywood’s all-time fave Nazis – who, as it happens, is featured prominently in the imbedded clip. Kosleck seems to be wearing the same uniform that he wore about a decade and a half later on Sanford & Son (yes, really). 14. Bosworth, Francks is currently playing a recurring character on Netflix series HEMLOCK GROVE that has been renewed (it was filmed in Canada). Like Leyton, Francks is a musician. But he has been most successful as a voice actor working on animated shows such as HEAVY METAL, INSPECTOR GADGET, and STAR WARS HOLIDAY SPECIAL. 15. Dozy, has there ever been a TV series Harlan Ellison has not hated? JERICHO was never meant to draw comparisons to HOGAN’S HEROES, but it is impossible not to compare the two series Nazis. John Dehner played a Nazi that had to have been trained by Colonel Klink. One of the problems with silly plots is the effect it has on the bad guys. In one episode Mark Richman played a worthy adversary, cunning and the only Nazi (including Hitler) that knew what was going on. Then he set up his HQ in the same building Jericho and friends were hiding out in the basement and lost all his intelligence. 16. Steve, you can remove (not even in color) from the post when you have the time. “It is terrible visually,…” makes the point. Mike, I like the Martin Kosleck story. Of course, space limited me in my list of guest cast. I even left out the surprisingly not bad Vic Damone! Ha! Good point, he was/is a man of strong opinions, but in case your question is more literal than figurative, I vaguely remember reading somewhere that as Ellison aged, he became a bit more mellow, praising various shows of the 80’s and 90’s. It was his feeling that the quality of tv programming was getting better. #21. Dozy, I share his admiration for BABYLON 5. There are some TV he did that he left his name on including LOGAN’S RUN (TV series episode), THE SIXTH SENSE and 1985 version of THE TWILIGHT ZONE. It is a shame for someone with such talent that he is remembered more for his mouth than his writing. I always felt he was too hard on television. TV is a collaborative medium, something Ellison had problems with. Plus Ellison most vocal complaints took place during the time where the dreams of what TV could be were crushed. Many in the early days of television saw TV as a way to enlighten the masses, to educate and inform through great classic arts of drama and music. But by the early-mid 60s the masses had made it clear they preferred mindless entertainment. TV production shifted from stage influenced New York to film influenced Hollywood. Ellison was not alone in his criticisms, but was the most entertainingly memorable. What Ellison refused to accept was the lack of power the writer has in television. Writers in film learned to become directors to protect their work, while the TV writer gained control by becoming the producer. I know I would pay to watch TV Showrunner Harlan Ellison deal with the networks. No fiction could equal that entertainment. I pretty much agree with everything from your last comment, and hope in the future Ellison will eventually remembered more for his splendid work than, as you put it, his mouth. (Which admittedly is also darn entertaining.) Connecting his disappointment with the medium and the particular era he toiled in is an interesting point. If he where 40 years younger and working at HBO or Showtime today he might have much more positive view of tv. And thank you for responding with such a thoughtful and polite comment. One is delighted that the people here are so much more genteel and dignified than say, at Reddit or YouTube. Was probably one of those kids you mentioned that liked the action. I found this show very enjoyable, can still tap out a few bars of the theme on the piano and own the book mentioned above as well. But I also have to confess to being a huge U.N.C.L.E. fan as well, 1966 and 1967 I was 13 and 14 so, much like the music of my life is rooted there, so are my TV favorites. And another note on Harlan Ellison, his most famous short story from “Dangerous Visions” was “I Have No Mouth and I Must Scream” which seems to sum up his persona as well ;-). Has just glad to find a post about Codename:Jericho, thank you! Dana, you can watch the entire season at the streaming site Warners Instant Archives. I have a link above in the review. They have a free two week trial so you can watch then cancel if you don’t want to be a member. Membership is $9.99 a month which I do recommend. Glad you enjoyed the look back. Thank you! Just watched the pilot with Tom Bosley…your comments above are right on, I couldn’t help myself from smiling all the way through. 1 down, 15 to go. Haven’t seen these since they originally aired. Dana, how did the paperback tie-in compare to the series? (NBC). To my knowledge Jericho was aired on TNT back in 1992 at 4 AM Saturday mornings when Ted Turner owned the MGM video library. Baa Baa Black Sheep AKA Black Sheep Squadron. when they aired it in 2001-2004. And don’t forget THE WACKIEST SHIP IN THE ARMY, a series loosely based on the Jack Lemmon film. Jim, I left a comment over at BARBARY COAST post about the announcement it will be released on DVD June 3rd. it not been shown on cable since. Too bad. Thanks for this information. I have a question I wonder if anyone can help us with. I’m a friend of the actor David Frankham, and David has a clear memory of working on a pilot for this. 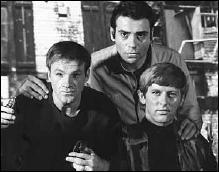 In that version he played the Englishman, Don Francks was the American, and another French actor (not Mase) played the Frenchman — “Jean [something]?”. It was directed by Sherman Marks. Unfortunately he remembers little else, but says the plot of the third episode (called the pilot here) was definitely not the storyline of the show he did. Does anyone know anything about a never-seen first “pre-pilot” pilot for JERICHO? I have not seen anything about a pre-pilot for JERICHO but it doesn’t surprise me. Many series ideas began with a pilot presentation, most lasting just fifteen minutes or less. A few are still in existence including HAZEL, THE MUNSTERS (the original), and MOST DEADLY GAME. many featured different casts. Some such as CAIN’S HUNDRED had early versions of uncompleted episodes shown to advertisers to encourage them to sponsor the show. Marks did direct the episode “Panic in the Piazza,” could that have had some of the plot? I mentioned in the review it had an idea from BLUE LIGHT, another series. It also featured the Italian army and the Germans arguing over who gets to keep the unexploded bomb. The promo sent to local stations (see above) is from the “pilot” third episode which probably was the first filmed. Thanks for writing the article. I watched the show and never forgave the network for cancelling it. I was talking to a friend about cancelled shows and thought of this one. The Internet is wonderful; you can find out about almost anything. D-Jack Webb about spies parachuting into Germany to help RAF pilots escape. David Frankham was in this but not Don Francks. Could be. Only David Frankham could tell us. Did it have a Frenchman in it? Thanks for bring our attention to another possible answer.